Big library systems struggling with the task of sorting interbranch requests for distribution on the library's delivery vehicles can buy a $2 million Lyngsoe Systems Compact Cross Belt Sorter, whose conveyor takes precisely hand-placed materials down a line of bins, scanning each item and tipping it into a bin destined for the right branch. Washington State's King County pioneered the Lyngsoe system in America, and their example prompted a consortium of the New York and Brooklyn Public Libraries to buy their own, to excellent effect. 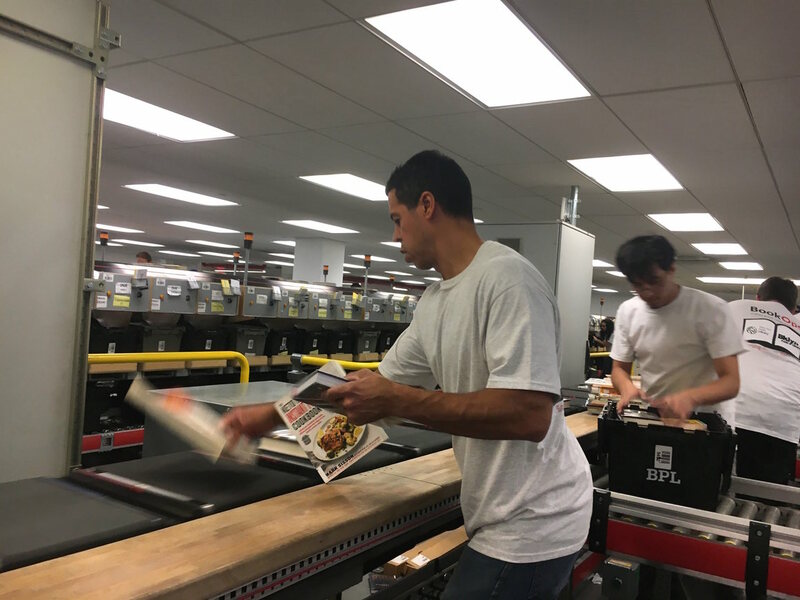 Using the Lyngsoe is a physical art: the belt passes at 1.5m/s and each item has to be precisely aligned for scanning and deposit into the correct bin; human sorters have to quickly and carefully handle a very heterogenuous set of materials: DVDs, oversized hardcovers, floppy manga collections, etc. In a first-of-its-kind competition, the King County and NY library workers faced off against each other in a head-to-head match to see who could sort the most materials, a race that sounds like a cross between gymnastics and juggling. Matthew Taub's Atlas Obscura writeup of the sorting competition makes for a fascinating counterpoint to the insider horror stories from Amazon's warehouses, the biggest difference being whether the automation has been procured to help workers make a difficult task easier (the libraries) or to work them right up to the point of physical impossibility to wring every last penny of value out of their labor (Amazon). NYC punk band The New York Rats is launching their new album on Sunday: it's a heavy vinyl LP with amazing sleeve art by Andrea Sicco; the album itself is Ramones-y, Husker-Du-ish uptempo punk that I've had on heavy rotation all week: it's 7:30PM on at Our Wicked Lady, 153 Morgan Ave, Brooklyn.